Portable salads are an easy go-to lunch option, and you can even pack them a few days in advance in the fridge if you know how to make it work. But it’s not quite as simple as just throwing everything into the jar and tossing it in the fridge – that way lies slimy spinach and soggy chicken breast. Here are 10 tips for making portable salads that you’ll actually want to eat, plus some delicious recipes for salads to try in a jar, a Tupperware, or any other container you can grab and go. 1. Layers will get you everywhere. Nobody likes soggy, wilted, slimy lettuce. The key to avoiding this is layers – start with the dressing at the very bottom, then move on up to the hardier vegetables that can stand up to sitting in the dressing for a while, then more fragile toppings like avocado, and use relatively dry protein components to separate the wet stuff from the fragile greens on top. For example, you could put the dressing at the bottom, then layer in cucumbers and tomatoes, chicken breast, and lettuce or spinach at the top. Gravity will keep the heavy wet stuff at the bottom, and the drier chicken breast helps protect the lettuce. Then just shake it up and pour it into a bowl when it’s time to eat. Italian Chopped Salad (Against All Grain): dressing, artichoke hearts and beets, green olives, chicken and salami, lettuce. Thai Chopped Chicken Salad (Lexi’s Clean Kitchen): layering instructions in the recipe. 2. If you have a bumpy ride, keep the dressing separate. Most portable salad recipes advise putting the dressing in the bottom of the jar. That’s fine if you’ll always be able to keep the salad upright, but it’s not great for bike commuters, students who tend to throw their backpacks around, or anyone else who needs a slightly more durable salad. You can buy salad containers with a separate dressing cup included, or just bring your dressing along in a separate smaller container. The tiny little plastic containers sold for toddler snacks work really well for this. 3. Use the right container. Mason jars are trendy and cute, but they’re also heavy and breakable, and they don’t have an easy built-in dressing holder the way some plastic containers do. They don’t hold very much spinach or lettuce, and they can be a pain to eat out of, unless you want to eat all the components of your salad separately. If you like mason jars, by all means, keep using them, but don’t sacrifice functionality for style – that’s a surefire way to get irritated at the whole project and give it up. If your lettuce always wilts no matter what you do, try something a little sturdier. Shredded cabbage is one great option. If you go for coleslaw, you can even break the dressing-on-the-bottom rule, and if you’re not a coleslaw person, you can easily use it in all kinds of other salads as well. Another green that holds up better than lettuce is kale. Don’t knock it until you’ve tried it with the right dressing and something crunchy on top! 5. Try it without the leaves. 6. Use a DRY container. Whether you go for glass, plastic, ceramic, or pure gold-plated titanium, make sure your container is dry as a bone before you start putting your salad in there. Wipe it out with a paper towel, or wipe it with a clean rag and then let it air-dry for a few minutes before you start. 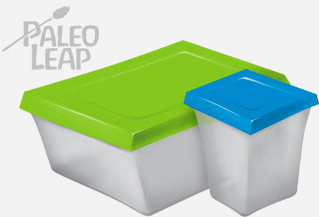 A wet container will give you wilted produce in no time. 7. If you’re using canned fish, try just bringing the can. Canned tuna or sardines are delicious over lettuce, maybe with a mustard vinaigrette and some other vegetables for color. But you know what’s not so delicious? Tuna-flavored lettuce, topped with tuna-flavored red peppers, tuna-flavored almond slices, and tuna, with a tuna-flavored vinaigrette. The hard fact of fish is that it has a distinctive smell. And since canned fish is already packaged in a portable container, you’re not losing any convenience by just throwing the whole can into your lunchbox and then opening it when you’re ready to eat. 8. Go for cherry tomatoes over slices. 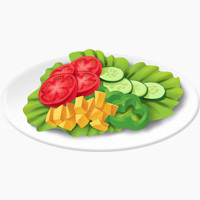 Tomato slices or wedges can be a great addition to a salad, but they tend to leak liquid over the course of a day or more in the fridge. Get the same flavor without the potential for sogginess by throwing in a couple of cherry tomatoes instead. 9. If you want avocado, sprinkle it with lemon juice before adding it. 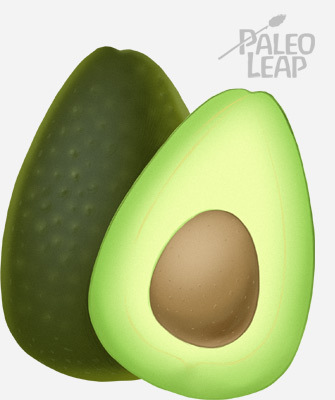 Avocado is a wonderful addition to any Paleo salad – it’s full of nutrients and healthy fats, and it tastes delicious. But brown avocado is arguably as gross as slimy lettuce. Avoid it completely by sprinkling the avocado with a few drops of lemon juice before you start packing it into your chosen container. The whole point of a portable salad is that you’re going to take it somewhere. Unless you plan perfectly every time you leave the house and never have emergencies, at some point you’re going to be running off in a rush. If your “salad” is still a pile of unwashed greens, un-chopped chicken breast, and various condiments scattered around the kitchen, chances are very low that you’ll have time to put it together. Making a nightly habit of prepping your salad for the next day is one great way to make sure it happens – and it’s the perfect time to incorporate dinner leftovers as well. Or do it in the morning if you work the night shift. Just make sure you do it.